Awesome Friday! » Blog Archive Legend of Korra: Book 1 Review / Book 2 Discussion - Awesome Friday! In April 2012, Nickelodeon released a sequel to the hit children’s cartoon Avatar: the Last Airbender. The Legend of Korra, originally a twelve-episode mini-series, was such a huge success that it was quickly renewed for three more seasons, with Book Two: Spirits starting up on Friday, September 13th. If you haven’t seen Book One: Air yet, you’re missing out on a fast-paced, action-packed story with stunning art, gorgeous music, and some of the best animation on TV. The fight choreography alone makes it a worthwhile watch. Don’t worry if you never watched Avatar — the show does a good job of recapping the important plot points so first-time viewers can follow along. As Book Two airs, I’ll be providing weekly episode recaps and theories here on Awesome Friday! To kick it all off, here is a Book One recap, along with some discussion and speculation about Book Two. 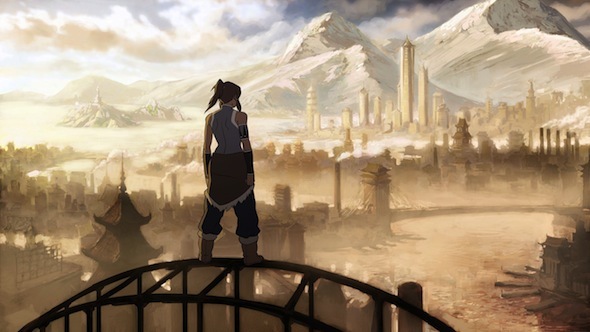 Avatar Korra overlooks Republic City. Alright, bear with me here — the writers crammed a ton of events into 12 episodes, so I’m going to do my best to summarize the main plot thread as succinctly as I can. For those of you who are brand new to the series, here are the basics: there are four types of magic in this universe, all based on bending (manipulating) a specific element – air, water, earth or fire. A bender has the innate ability to bend one element, channeling their powers through martial arts moves and stances. Only the Avatar can bend more than one element; it’s his/her duty to master all four elements and maintain balance in the world. When the Avatar dies, they are reincarnated as a new Avatar, who must again re-master all four elements. 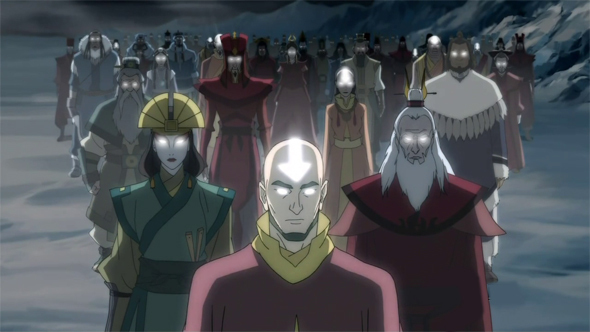 The Avatar also has a connection to the spirit world (allowing them to view and speak with spirits), as well as the Avatar State, a glowing-eyed, trancelike state where they tap into the power and wisdom of all their past incarnations. Traditionally, the world was divided into four lands based on the element types: the Fire Nation, the Earth Kingdom, the Air Temples (though airbenders were nearly driven to extinction during a war with the Fire Nation), and the Northern/Southern Water Tribes. Between the events of Avatar: the Last Airbender and The Legend of Korra, Avatar Aang (the main protagonist of Avatar) and his friends established Republic City, a former Fire Nation colony that now stands as a beacon of progress and unity. The City is made up of benders and non-benders of all backgrounds, and is led by the Republic City Council, a council made up of one representative from each of the lands. Republic City is the main backdrop of Book One, and we see a city bustling with progress, but also plagued by bending gangs and social unrest. 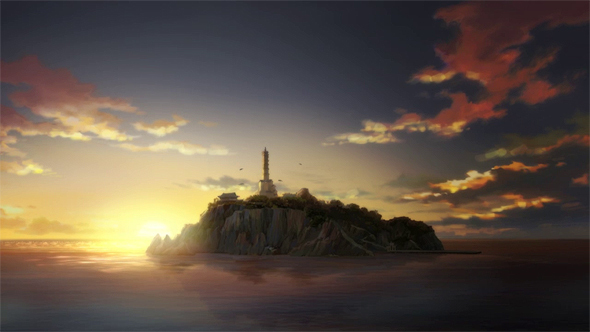 It’s also the home of Air Temple Island, a temple where the four last surviving airbenders — all descendants of Avatar Aang — reside and train. Book One starts off in the South Pole, where we’re introduced to 17-year-old Avatar Korra, a strong, brash young woman who has spent most of her life training to be the Avatar in a special compound. As of episode 1, she has mastered water, earth and fire, but has yet to bend even a puff of air. She also struggles with patience and spirituality, two traits she hopes to learn from her airbending mentor, Tenzin, who is scheduled to bring his family and live at the South Pole until she has mastered airbending. Tenzin is the youngest son of the late Avatar Aang and the great Katara (another main character from Avatar), and he’s a prominent representative on the Republic City Council. When he and his family arrive, Korra is frustrated to learn he has no intentions of staying. Tension in Republic City is so great that he must remain there and focus his efforts politically instead; her airbending training will have to wait. In the meantime, she must stay at the South Pole in her training compound where she will be safe from danger. Korra and Naga head for Republic City. 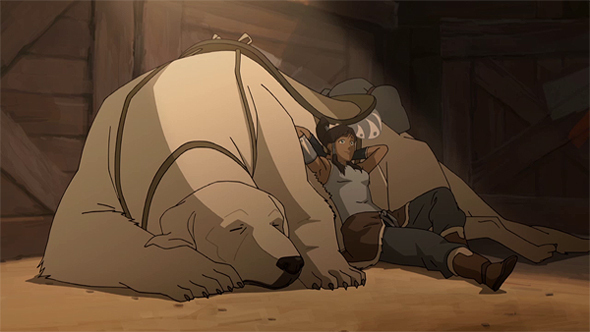 Korra is having none of it, and after bidding farewell to her loved ones, she travels to Republic City, bringing her trusted animal companion — Naga, a polar bear dog — with her. After some cultural misunderstandings, and encounter with a bending gang and a run-in with local police chief Lin Beifong (daughter of the great Toph Beifong from Avatar), Tenzin reluctantly agrees to house Korra at Air Temple Island, where he will be able to train her and still keep his political commitments. Air Temple Island, a short ferry ride from Republic City. Airbending doesn’t come easily, however, and a frustrated Korra finds herself distracted by pro-bending, a fast-paced arena sport for benders. Initially, Tenzin is skeptical of her obsession with the sport, but soon it becomes apparent that the pro-bending arena is an excellent venue for Korra to practice the dodging manoeuvres and “be the leaf on the wind” attitude that are a part of the evasive art of airbending. Korra joins brothers Mako (an aloof firebender) and Bolin (a happy-go-lucky earthbender) on The Fire Ferrets, a team that quickly rises through the ranks. Together with the two brothers, and Mako’s girlfriend, a non-bender named Asami (the plucky, fashionable and capable daugher of famous industrialist Hiroshi Sato), a strong friendship begins to form. The new Team Avatar. (L-R) Asami, Mako, Korra and Bolin. As the series progresses, life in Republic City gets more and more dangerous — a terrorist organization called the Equalists, headed by a mysterious masked man named Amon, is beginning to pick up steam. The Equalists claim to be fighting against bender oppression of non-benders. Amon seeks to “equalize” the world by using a supposed spirit-given gift to remove a bender’s bending permanently, one bender at a time, by touching his hand to his victim’s forehead. Until this point, Avatar Aang is the only person in known history with the ability to permanently remove bending, so Amon poses a potent threat. At his side is the Lieutenant, a moustached man who wields electrified kali sticks, and the chi-blockers, masked acrobats who have mastered the art of chi-blocking (temporarily removing bending ability by striking chi points.) While the Equalists are clearly positioned as the villains of the story, we are shown several instances where benders really do oppress non-benders (sometimes even the main characters themselves), making the villain’s cause more sympathetic than one might expect in a children’s cartoon. As the series progresses, Amon’s revolution becomes more and more aggressive, with robots, airships and even airplanes bringing war to Republic City. These machines are supplied by Hiroshi Sato, Asami’s father, and in a dramatic showdown midway through the season, Asami is forced to choose between her father and her friends. Horrified by her father’s lust for war, she sides with Korra, and joins “Team Avatar” in patrolling the city streets to combat the Equalists. Amon and the Equalists hold a rally to gain more followers and supporters. Amon isn’t the only source of chaos in Republic City. Councilman Tarrlok, the representative for the Northern Water Tribe and one of Tenzin’s colleagues, is a wily politician who constantly seems to have a hidden agenda. He has taken it upon himself to save Republic City from the Equalists and become the city’s saviour. Tarrlok initially convinces Korra to help him with his anti-Equalist task force, but his extreme with-us-or-against-us approach eventually draws Korra’s fury. Tension between the two escalates until one day, Tarrlok arrests an entire neighbourhood of non-benders for being “Equalist conspirators” — and also Asami, Mako and Bolin. An irate Korra confronts Tarrlok in his office, culminating in a full-out battle that is one of the most memorable fights of the season. As Korra closes in for a final blow, Tarrlok falls back on bloodbending to defeat her; bloodbending is a rare, advanced, illegal and dangerous waterbending technique that allows the bender to control another person by manipulating the fluids in their body, essentially turning them into a puppet. He subdues Korra and abducts her, then tries to blame her disappearance on the Equalists. The holes in his story quickly begin to unravel, however, and soon his use of the illegal art is revealed to Tenzin, the police and Korra’s friends. Disgraced, Tarrlok flees, intending to start a new life with Korra as his hostage, but just as he’s preparing to move her, his plans are interrupted by Amon. Bloodbending has no effect on the masked terrorist, who easily takes Tarrlok’s bending and captures him — accidentally giving Korra the chance to escape in the process. Near the end of the season, the Equalists take out the Council, capture Air Temple Island and plunge Republic City into full-out war. Tenzin and his family, the last of the airbenders, go into hiding with the help of Lin Beifong, who ultimately sacrifices her bending to Amon to keep them safe. Korra and her friends go into hiding with a group of hermits, waiting for the United Forces army (an army made up of benders from every part of the world) to come to their aid. When they arrive, we’re introduced to Iroh II, the swashbuckling grandson of ex-Fire Lord Zuko (the bad guy-turned-good guy in Avatar). Iroh II and his army begin to push back on Amon’s stranglehold on the city. As Iroh II, Bolin and Asami make it their personal mission to stop Asami’s father, Korra and Mako try to figure out how to stop Amon. While doing reconnaissance, Korra and Mako chance upon a bedraggled Tarrlok, who is being held prisoner in the new Equalist base. He reveals that Amon is his long-lost brother, Noatak, who is an extremely powerful bloodbender; Tarrlok recognized his brother’s bloodbending grip as his bending was taken, meaning that Amon somehow uses bloodbending to take bending. The two brothers are the sons of infamous bloodbending mob boss Yakone, who was stripped of his bending and sent into exile by Avatar Aang. Hidden away at the North Pole, Yakone brutally trained his two boys to take over Republic City and exact revenge on the Avatar, until a teenaged Noatak rebelled, ran away from home and was presumed dead. Yakone training Noatak and Tarrlok to bloodbend. 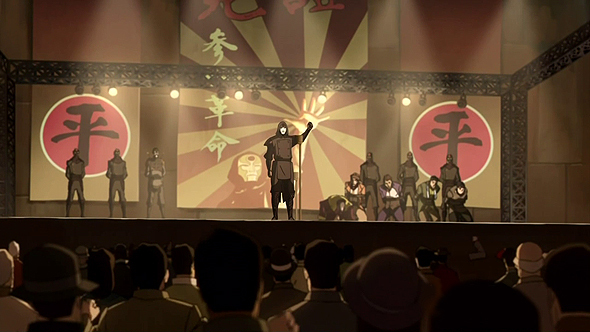 Armed with this information, Korra and Mako confront Amon, who is on a stage in front of thousands of supporters, and about to take the bending of Tenzin and his family. (Who, somehow, were found and captured off-camera.) Amon denies their accusations, still sticking to his backstory that his family was killed by firebenders. He pulls off his mask and reveals a scarred face to prove it. A battle ensues, but Amon’s bloodbending is too powerful to fight against, and he successfully takes Korra’s bending. He’s about to take Mako’s as well, when Korra suddenly and conveniently breaks through her airbending block and knocks Amon out a window and into the bay. Nearly drowning, Amon panics and waterbends to safety…revealing himself to be a bender in front of hundreds of his followers. His “scars”, only makeup, have washed away, making it perfectly clear that his entire story was a lie. 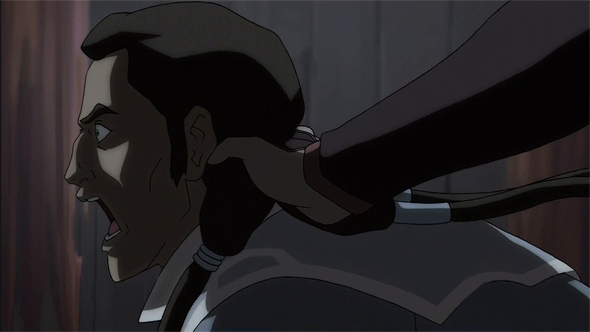 His following destroyed, Amon retreats to Tarrlok’s cell, pleading with his brother to run away with him so they can start a new life together: “You’re all I have left in the world.” As they’re sailing out to sea, Tarrlok, seemingly believing that neither of them can be redeemed, sparks the gas tank and explodes their boat in a murder-suicide. Korra, meanwhile, is distraught that Amon managed to take all her bending away except airbending, and just as she’s falling into despair, she’s contacted by Avatar Aang. He leaves her with the words, “When we hit our lowest point, we are open to the greatest change” and gives her back her bending. She’s then able to go into the Avatar State and return the bending to all those who lost it to Amon. 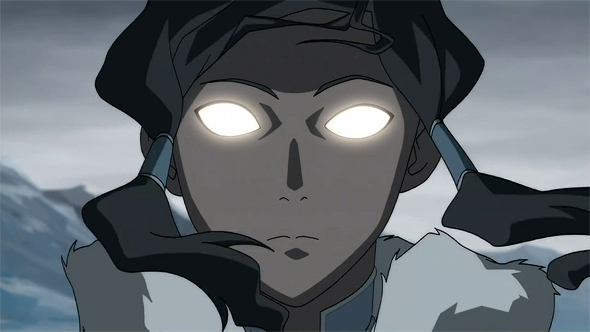 Korra enters the Avatar State for the first time. And then she kisses Mako. Oops, I didn’t mention the love quadrangle, did I? 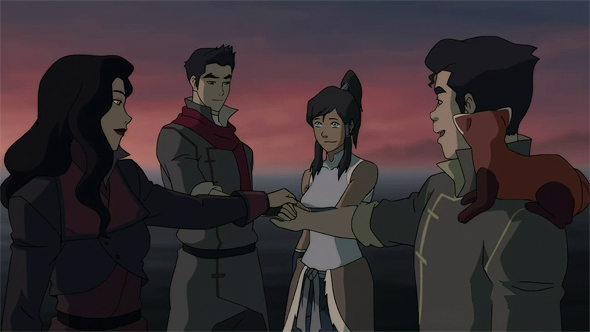 Well, Korra likes Mako, but Mako likes Asami andKorra, but Bolin likes Korra, and– You know, all I’ll say on the topic is, I hope we won’t have to spend any more screen time on love triangles in Book Two. There’s also a pro-bending story arc, some character-building side stories, and some light-hearted scenes to break up the tension — this summary, as long as it is, left out many plot points. Because the show was originally slated to be just one season, the story did feel rushed, particularly the push at the end to return to the status quo. Now that the creators have three seasons in which to properly pace themselves, it’ll be interesting to see if this fixes any of the pacing issues that fans and critics felt were a problem in Book One. Each season is set to be its own self-contained story, but now the overall character arcs will have room to breathe across all three new seasons. “Spirit” will be 14 episodes long, and 2 of those episodes will flash back to the very first Avatar, Wan (voiced by Steven Yuen). About half of the episodes will take place in Republic City, and the other half will take place in other locations, including the Spirit World. Joining the cast will be several new characters, including Tenzin’s sister Kya (Lisa Edelstein), Korra’s uncle Unalaq (Adrian LaTourelle), her twin cousins Eska (Aubrey Plaza) and Desna (Aaron Himelstein), and eccentric businessman Varrick (John Michael Higgins). We’ll also learn more about Korra’s father Tonraq and Tenzin’s brother Bumi, two characters who had very limited screen time in Book One. The season will begin at the South Pole, where we will learn that tension is escalating between the Northern and Southern Water Tribes — meaning Korra’s father Tonraq is at odds with her uncle Unalaq. Mako has joined the Republic City Police, and Bolin is still pro-bending. Asami has stepped up to run Future Industries after her father was outed as an Equalist. Some of the new characters in Book 2. 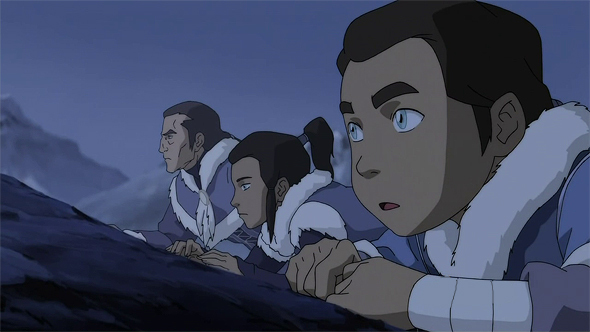 (L-R) Wan, Kya, Unalaq, Eska, Desna, and Varrick. There’s plenty of fan speculation about how the season is going to play out, and popular opinion seems to be that Unalaq is going to be the main antagonist. I’d love for the season to throw us a curve or two, the way Book One did with Tarrlok’s reveal as a bloodbender, and give us something less predictable than another waterbending ally who is actually an antagonist. The waterbending-brothers-at-odds thing already played out in Book One, anyway, so I hope we don’t see too much more of the same with Tonraq and Unalaq. Though, as some fans have speculated, it could be interesting if Tonraq turned out to be the “bad guy”, and Korra had to use her new-found spiritual skills to try to convince/oppose her own father. A notable absence in all the promotional material has been fan favourite Lin Beifong. I’m thinking that with half the episodes set in Republic City, there has to be at least an appearance by its Chief of Police, particularly because she’s such a popular character. We’ll find out soon enough — less than one more week to go! Book Two will debut with two episodes at 7pm on September 13th, 2013 on Nickelodeon. Stay tuned for weekly episode recaps and speculation. In the meantime, what are your hopes, fears and theories for Book Two? Feel free to discuss in the comments section below!